Common and rarer rhythms from 2 to 9 beats per bar (2/2, 4/2, 2/4, 3/4, 4/4, 5/4, 6/4, 7/4, 6/8, 7/8, 9/8). More than 200 fixed exercises (100 (longer ones) on iPad). Levels for absolute beginners as well as professionals. More difficult exercises include rests, ties, syncopations, duplets, triplets, quadruplets. Option to add swing to every quarter note meter exercise. Different degrees of swing: light, medium and hard. Automatic count-off with one or two bars. Longer (random) exercises in landscape orientation. Practice mode: listen or tap along while the rhythm is played. 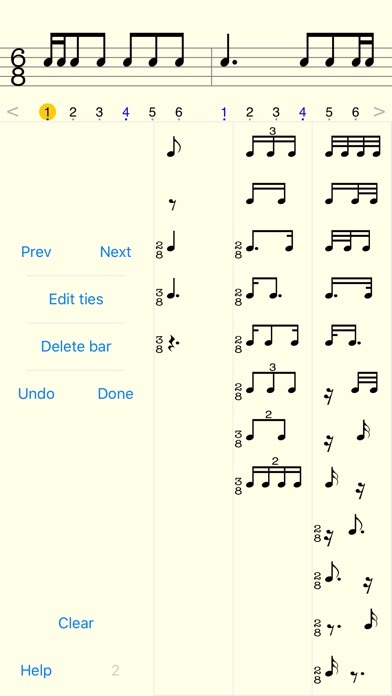 Test mode: you hear the metronome and must read and tap the rhythm. Accuracy is instantly displayed visually (color and position) with each tap. Easily adjust metronome tempo by sliding or keypad. Two tap buttons for higher tempos. Any exercise can serve as a starting point for editing. The editor provides many options to tailor exercises to your needs. Designed to need very few taps. Includes an editor for ties. Add your exercises to favorites. Expert mode: a higher default tempo for the exercises plus more accuracy required in tapping. Left- and right-hand independence: tap the beat and rhythm with two tap buttons. Count 6/8 in two (dotted quarter has the beat). Ear training function to help in rhythmic dictation. Frequency chart of tap results. Progress reports for fixed and random exercises. Mail your results: e.g. send your 100% score graphic or progress reports. Sounds of the app player, metronome and taps can be chosen from several percussive instruments. Optional stereo sound. Hear your taps in the right ear and the metronome/player in the left ear. Use of the microphone as an alternative to the tap buttons. Play the rhythm with hand claps, finger-snaps or an instrument. Very low latency (instant response). Classical as well as flat interface themes.